What I like making homemade pizzas is the unique toppings that I can create. I can add any of my favourite ingredients on top, and as many as I like. This spicy Hawaiian pizza was baked on the same day when I made the BBQ chicken pizza. One dough, two variations. I just topped the pizza with a few slices of salami, my daughter’s favourite, then turned the traditional Hawaiian pizza into a spicy one, adding a kick in flavour and going really well with pineapples. Heat butter in a non-stick frying pan over medium heat. Add onion and garlic, cook until soft and fragrant. Be sure not to burn the ingredients. It tastes bitter otherwise. Add tomatoes and increase heat to high. Bring it to a boil. Add tomato paste, sugar, salt, pepper, oregano, basil. Mix well and continue to cook until it boils again. Reduce heat to simmer for 20 minutes, stirring occasionally, until sauce thickens. Let cool a bit and ready for use. Prepare pizza dough (Please refer to this recipe for making dough.) Roll out the dough out into a round disc, about 0.5cm in thickness. Transfer onto a slightly larger greased pizza pan (sheet pan). Drizzle a bit of olive oil on the dough surface and spread evenly to avoid your dough from being soggy. Spoon couples of tablespoons of homemade tomato sauce and spread evenly on the dough. Add some cheese, then ham, pineapple, salami. Sprinkle the rest of cheese on top. Bake in preheated oven for about 10 to 12 minutes, or until the base is golden brown, cheese melts, and toppings are bubbly. Serve hot. Oregano is commonly used in making pizza sauce. It’s also known as “pizza herb”. I find the dried ones are good enough to make pizzas. Keep a bottle of this pizza herb in my pantry, always ready for use at any time. Brown sugar is a good partner with tomatoes. You can use white sugar instead. 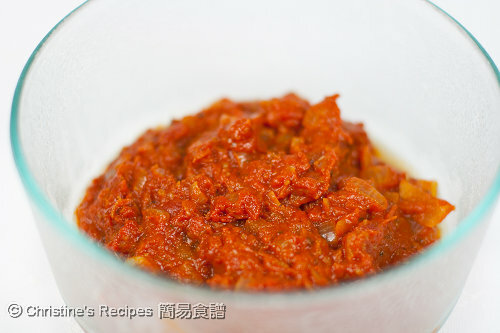 I used the canned, peeled and deseeded tomatoes for connivance. If you like to use fresh tomatoes, just put 500 grams of tomatoes in hot water. Then you can easily peel off their skins. Deseed and cut into dices. Follow above steps to cook the sauce. You have to adjust the amount of seasoning and cooking time as fresh tomatoes contain more liquid. I love Hawaiian pizza with lots of pineapple in it! Hi Christine, I know it's been awhile eversince the FB changed their front page! Olala...this sounds so tempting! Spicy flavour pizza...hmm...mm... Stay in touch & have a great day! I don't eat a lot of pizza but yours is too hard to resist. It looks perfect and very delicious. I love all the pineapple pieces. 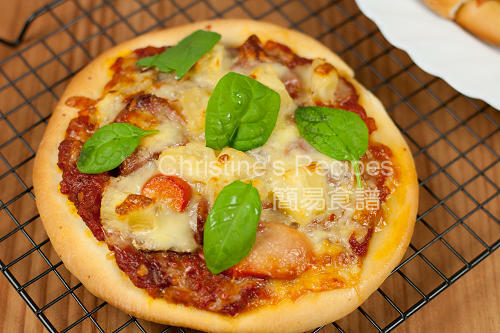 Hawaiian pizza is one of my top choices of pizza, and I often add to my own slice some chili sauce. Love this spicy version, no doubt. 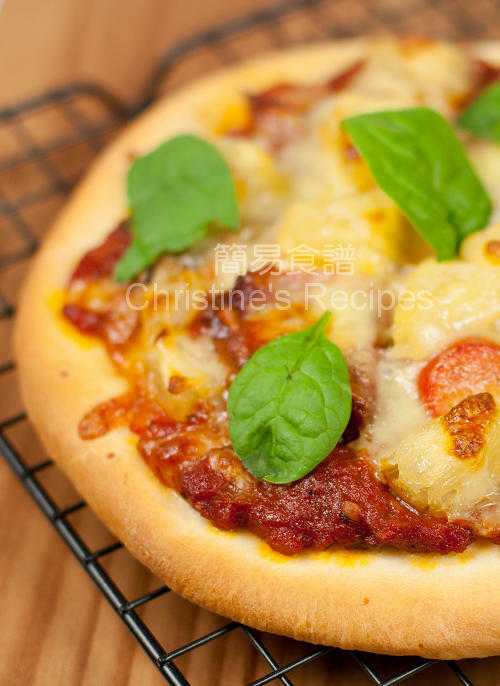 Hawaiian pizza is our favorite and I love your homemade spicy version, yum! your home made sauce looks so amazing. and I like the salami twist for some heat. Nice pizza, I always like pineapple on my :-) Love the idea of spicing up as well. I love Hawaiian pizza! My favorite! And spicing it up is such a great idea. I have used linguica (Portuguese sausage) sometimes. Next time, I'll give salami a try. Thanks! Hawaiian pizza is always my favorite pizza choice ;) But I don't think I have tried spicy ones before. Wat a beautiful presentation! The pizza looks simply delicious! This is one georgous & perfect pizza to jazz up !!! what a great pizza...so many great flavors..
Well, honestly, I dislike pineapple on my pizza but how could I refuse something that looks that good! I love the shot of the tomato sauce - it looks so rich! Nothing beats a homemade pizza. Love hawaiian and to top it with some spiciness, it's a winner!